... ever smiling and curious. ... over 1000 Buddha Statues. ... caves and lakes around Hpa An. Hpa An is the state capital of Karen State with about 80.000 inhabitants. Literally it can be translated with frog vomit. Of course we tell you the origin of the name. We pick you up at your hotel. 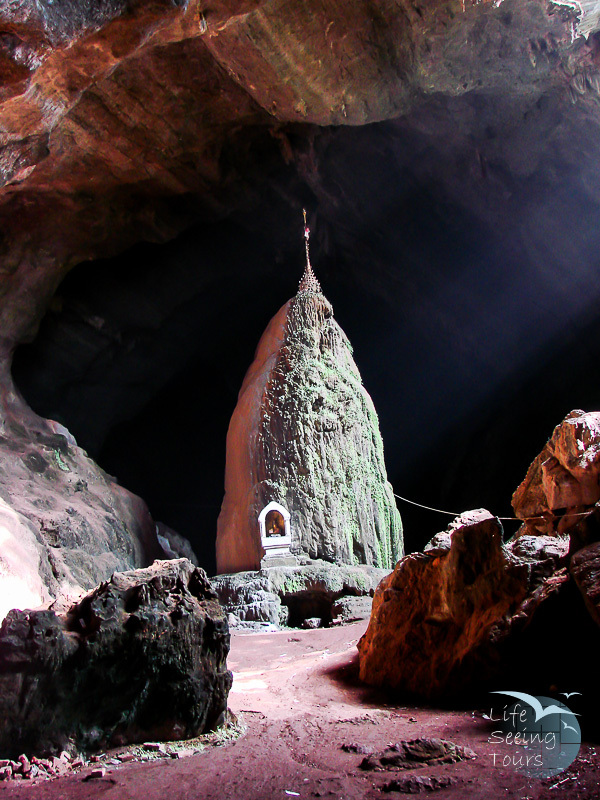 After a short drive we visit Kaw Gun Cave also known as the ‘Cave of the Ten Thousand Buddha’s. The walls are holding up more than 2000 tablets of Lord Buddha with Mon inscriptions. Until today not all of them are encrypt as the cave can be dated back to the 7th century. Our next stop is Kyauk Kalat Monastery, which is built on top of a single rock formations surrounded by a scenic lake. Further down the road is Lumbini Garden with Mt. Zwekabin as a scenic backdrop. The 1000 Buddha statues and the 722 Meter high mountain are giving the place a mystic touch. We enjoy traditional Mon lunch at a nearby local restaurant. Probably the most beautiful cave is Saddar Cave. We walk through an entire lime stone mountain range. Especially the caves stalagmites and stalactites are incredibly beautiful. Fortunately we don’t need to return the same way. A traditional wooden boat is taking us under the lime stone range back to the car park. In the late afternoon we visit the bat cave, where more than thousands of bats come out every night to find food. The sky is darkening and it is said they fly as far as Mawlamyine to still there hunger. After sunset return to your hotel.